I wonder why no other of these apart from C1 (33001) of this class were preserved? Such a shame. I wonder if any came close to preservation? 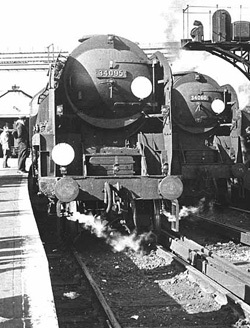 Also why are these classed as Austerity class (When in-fact bulleid by design) Is it because of the 0-6-0 wheel formation? Bulleid Pacific wrote: I wonder why no other of these apart from C1 (33001) of this class were preserved? Such a shame. I wonder if any came close to preservation? I've read that 33001 was returned to the NRM in 2004. I was lucky enough to see it performing on the Bluebell Railway in 1993 and again in 1995, where it was simply toying with its 7-coach load. I saw 33001 on the Bluebell when I first visited there. Unfortunately she wasn't in steam. It's interesting that 33001 was perserved yet 35001 and 34001 slipped the net. I assume there was a conscious decision made at the time to hold on the first of the class. Anyone have the story on this? Somewhere I remember an article in one of the railway magazines by someone who was on the committee telling how they made the decisions. I don't know why only one was preserved. They were called Austerities because they were built in 1942 when all new non-military equipment (including household items and clothing) had to be considered austere in order to procure the raw materials required. BTW, when I was a kid around Woking in the 50's and 60's Q1's were always called Coffee Pots, never Charlies. Here's a photo of 33020 shunting outside my house in 1966 or 1967. Is it True that the Q1 at the NRM has been offered to the MHR? I hope so because then I might stand a chance of seeing it at work. I understand from reliable sources that the remaining Q1 requires Crown Stays replacement. But obviously will require some other remedial work??? I understand there has been some discussions that have taken place regarding the sole surviving Q1 possibly going to the MHR? Is this just pure speculation, or is this on the books? Does anyone have any info to what is going to happen to the sole-surviving Q1 in the future? Surely a waste to keep at the NRM?